When I was entering the third grade, I transferred from a public school where I had many friends to a catholic school where I had none. While my public school friends were still my friends, I went to my new school every day wondering when I would feel the level of comfort and fitting in that I had at my previous school. Whereas I was outgoing, perhaps to a fault, at my old school, I was quiet and lonely at my new one. It was there that I learned about Girl Scouts, which most of the girls in the class belonged to. On the days when their troop would meet after school, the girls would wear their green vests with all these badges to school. I remember gazing at the badges, imaging all the excitement and adventure they might have experienced earning them. I felt like if I could just join, then maybe I would fit in at the school a little better. As if that green uniform would suddenly break me out of the shell that held me back from friendships. Meanwhile, I stuck out in my plain ol’ Catholic school uniform. I never did join Girl Scouts. Paige is going to be a Daisy next year – a precursor to Brownies and Girl Scouts. She’s psyched, which makes me so excited for her. Though I didn’t belong to Girl Scouts as a girl, I did once attend a Girl Scout camp and found it to be a wonderful experience. And in a strange way, this lets me live that childhood dream of being a Girl Scout vicariously through her. Is that weird? I hope not, because I couldn’t talk Paige out of Daisies if I tried. 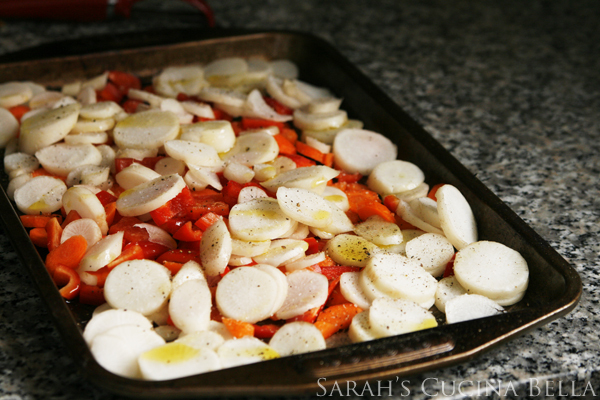 It’s a little like me and roasted vegetables … until it gets so warm that heating the stove becomes a dread-filled task, I keep on roasting. 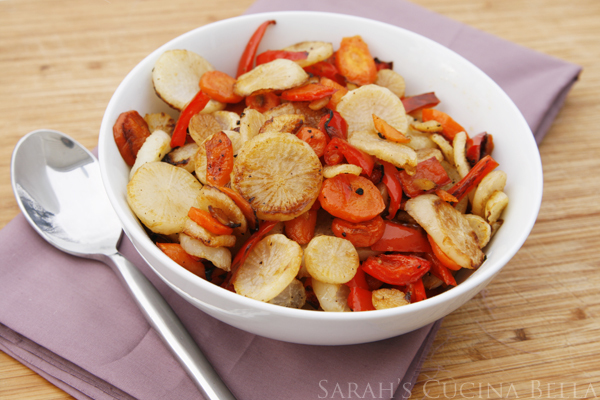 Because roasted vegetables are totally awesome. This recipe is a favorite — sweet, hearty, a little sharp. It’s perfect for a light lunch or as a side dish with dinner. And the star? 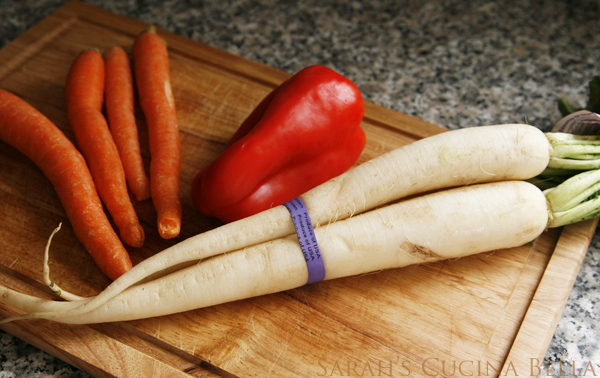 It’s the daikon radish, a long white root vegetable that looks a little like a white carrot — but it’s not. With a super thin skin, this radish needs a good scrub but no peeling to be ready to eat or cook with. Daikon radishes are a milder radish, and when roasted the sweet-slightly sharp flavor really develops. Until this spring, I’d only had daikon radishes in Daikon Salad, which I adore. But like other radishes, they totally rock when roasted as well. 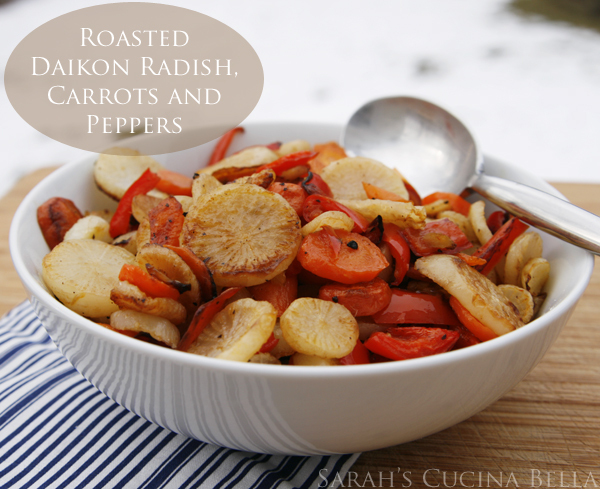 The daikon radishes are sliced up and tossed with carrots, red peppers, shallots, olive oil, salt and pepper. And then they are roasted in the oven until they are tender and a little golden. But before they are actually done, you drizzle them with a little balsamic vinegar and let them cook a little more. The flavor is incredible. You can eat this straight out of the oven, or serve it over rice. The leftovers are awesome too. Preheat the oven to 400 degrees. 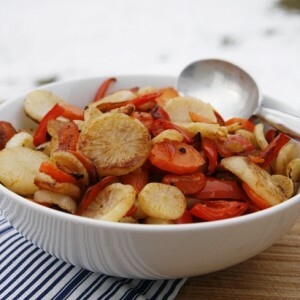 Combine the daikon, carrots, red peppers, shallot and olive oil on a nonstick baking sheet. Season well with salt and pepper. Roast for 25-30 minutes, stirring once or twice until tender. Drizzle the veggies with balsamic vinegar and return to the oven. Roast for an additional 5 minutes. Toss well and then transfer to a serving bowl. Great photos of a tasty looking vegan dish. I’d like to try this one soon. I have sautéed daikon but never roasted it, so I’m looking forward to getting some more in our CSA farm share so I can try roasting (quick quick, before the kitchen gets too hot to roast in). This sounds like it would be good at room temp, too, so perhaps cranking the oven before it gets too hot, and leaving the drizzled veggies in the fridge before bringing back to room temp for dinner might work. I love all varieties of radishes cooked — but roasting them has really captured my heart recently. Thanks so much for your kind comment! Thanks for a new way to cook with daikon radishes. It’s such an interesting vegetable, and now I can’t wait to try roasting them. Your photo looks delicious with just the right amount of caramelization. i was never a girl scout. i did belong to 4-H because we lived on a farm. Girl Scouts was for “town girls” – which I was not. After my parents moved to town, I was too old to go. Its fine. I learned to cook and sew and take care of every kind of animal from kittens to piglets to calves to colts. It’s all good. Anne, that’s so interesting! I always lived in more urban suburban areas (does that make sense?) so I didn’t hear about 4-H until we moved to the country when I was in high school. Unfortunately, I never did learn to sew. 😉 But, so far, my daughter is loving Daisies. Tried this for dinner–so delicious. I also added the greens for the last 2 minutes of cook time. Wow, this was fantastic! Had some Daikon left over from a batch of kimchi, did a search for some daikon recipe and came across this. Had the rest of the ingredients so I gave it a shot…sounded good, but it was way better then good! 2 thumbsup!